Kimberly Woodhouse treats her audience to an engaging historical account in her latest novel, The Mayflower Bride. Mary Elizabeth Chapman crouched low in the rafters beside her best friend Dorothy Raynsford and listened to Pastor John Robinson confirm to the congregation they had the patent from the Virginia Company to settle a colony in the New World. Reeling from the news, Mary Elizabeth’s first thought was she would leave the grave of her beloved mother behind in her Holland homeland. Her family would travel across the vast ocean to this new and strange land with the likes of the Strangers. She was a Separatist as was the rest of her congregation. Strangers could not be trusted. It was the Separatists who wanted to separate themselves from the Church of England and it was common knowledge that anyone outside of their group was a Stranger. Contrary to Mary Elizabeth’s apprehension, Dorothy embraced the notion as she tried to convince her friend of the wonderful adventure they were about to embark upon. Dorothy couldn’t possibly know such adventure would come with great peril. In July 1620, Mary Elizabeth and the small congregation of Strangers set out toward the open sea on the Speedwell. Mary Elizabeth’s heart grew heavy as the shoreline dwindled on her horizon. She questioned whether she could truly do this. She had no choice. Why did her mother have to die? Why wouldn’t her father listen to reason? What about her young brother David? He was barely eight years old. What kind of danger was the Chapman family placing themselves in? It wouldn’t be long before answers to Mary Elizabeth’s questions would surface. Mere weeks into their voyage the Speedwell faced her first challenge. It seems it had sprung a leak and was taking on water. The crew must ready about and head toward Southampton, Englandfor repairs. William Lytton prepared for his departure from Southampton, England. He too was headed to the New World on a vessel known as the Mayflower. Orphaned at a young age and prior to being taken in by his master Paul, William lived on the streets. He squandered what little food he could from trash cans and alleyways and it was difficult at best to trust this man Paul. Over time, William would learn to trust and not long after he buried the only person who ever cared for him, he decided England had nothing left to offer. Time, faith and the prospect of the New World were on William’s horizon. What he didn’t know was love, marriage and the prospect of happily every after could be his for the taking as well. Kimberly Woodhouse has done an admirable job of anchoring the timeline of a journey into the new and untamed New World. She’s taken the time to set the tone of the dynamics between man and woman during this era, but also shone a bright light on the intrinsic faith these people had in their Lord. She references scripture often to complement the many scenes related to such scripture. 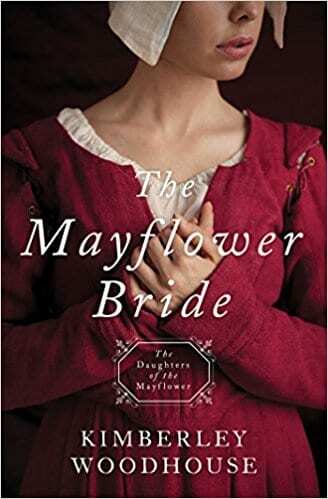 While I’ve not had the pleasure to read any of Ms. Woodhouse’s other works in this series, the thing that resonated with me in The Mayflower Bride, was that it is a novel that can stand on its own merits. To this note, she assists her audience by providing a guide in the beginning of her book that defines not only the characters, but a glossary of terms used that are specific to sailing. There are many highs (and some lows) which manage to move the story along at a pleasant and engaging pace. Ms. Woodhouse has a winning formula that naturally welcomes a vast audience to sit back and enjoy the read ahead. Well done Ms. Woodhouse. I look forward to your next book. Quill Says: The Mayflower Bride is a captivating historical account that carries a well-seated message of faith throughout the read.